Millions of snowboaders plan for snow fuelled fun in the white shade of winter season. Many people consider boots, warm clothing and boards as essentials for this season whereas others prefer to pick technology as their first need. It is definitely a great idea to record all those precious movements with a HD action camera and share an impressive footage with friends on social media. There are so many well priced and highly featured devices available in market that can assist in your photography. They come with weather sealing and can be comfortable attached to body during skiing. What makes a good Snowboarding/skiing action camera? Waterproof and Rugged: Generally snow covered slopes as well as skiing locations use to have extreme temperature conditions so an action camera must be capable enough to withstand those situations. Most of the advanced units are designs with rugged construction so even if you drop them during activity they will not face any damage. They must serve with shockproof and freezproof abilities so support extreme weather conditions. Ease of Use: A good skiing or snowboard camera is desired to serve proper accessibility to all controls quickly. One must be able to operate it even while wearing gloves and voice control feature is most essential one. Size and Weight: Lightweight is always the first choice of professionals so that it can be easily mounted on body or helmet etc. Mounting arrangements must be user friendly and it must support great image stabilization feature so that stills and videos can be captured with shake free results. Video Resolution:Photo 12MP, 4K at 30fps. Features: Touchscreen LCD Display, RAW & WDR Photos, Linear Field of View, GPS, Voice Control, Advanced Wind Noise Reduction, Electronic Image Stabilization and WiFi+Bluetooth. Waterproof: Up to 33 feet or 10 Meter without case. 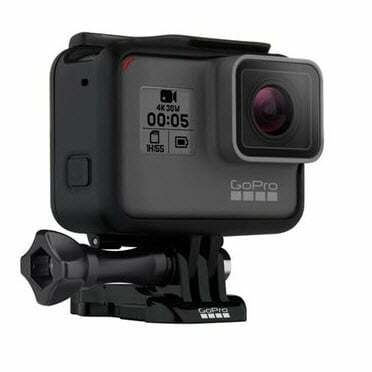 Recommendation: This GoPro device well known as a feature rich action camera unit that offers 4K resolution with super wide view and stills can be captured up to 12MP with 30 fps burst rate. You can take it under water up to 60 meters even without any special arrangement. Users can preview footage from 2 inch touch screen easily and its 1220 mAh batter can serve up to 100 minutes even with 4K settings. Video Resolution:2160p at 24fps (360 degree video) and 29MP stills. Features: Wi+Bluetooth, 360 degree videos, ISO sensitivity, SnapBridge Integration, Lighweight, Autofocus, Electronic Vibration Reduction. Recommendation: This camera is well known for its ability to produce pre-stitched 360 degree videos at 4K resolution and stills can be produced with breathtaking quality at 29MP. You can take it under water up to 100 feet and it serves shake free photos with its electronic vibration reduction feature. Battery life is short but it is compatible with Window as well as Mac desktop softwares so you can share files easily. Its Autofocus feature is appreciated by users. Features:Live View remote, 4K timelaspe, Blue+ Wi-Fi, balanced optical steady shot stabilization, Zeiss Tessar Multicoated lens, White balance mode, noise reduction. Recommendation:This camera is well famous for its excellent audio and image quality. People love to use it at tough locations due to its great optical image stabilization feature. 4K resolution leads to impressive results and the best part is its live vie remote control feature. You can capture 4K videos with time lapse mode and it can serve you with longer battery life. You need to protect it with additional housing arrangement for under water shoots but the case is included in package. The time lapse mode support makes it suitable for snowboarding needs and white balance is perfect choice for shooting at snowy mountains. Video Resolution: 16MP Still and 1080p with 60/30 fps. Features:Wi-Fi + App, 2” TFT LCD Screen, 170 degree wide angle lens, super long battery life, up to 64GB MicroSD storage. Recommendation:Dazzne seems to be a great choice if you are low in budget as it can provide stunning 1080p resolution recording facility at high speed. If you are thinking to buy a camera that can support great footage at high speed then Dazzne cannot provide you much better results as it does not possess built in gyro to assist with image stabilization. Battery life is excellent for this model but it is less suitable for under water needs. It is not much useful for under water applications due to very small range but if you apply additional protective housing then it can serve with better results. Controls becomes little difficult to operate with additional housing. Video Resolution: 16MP stills and 1920x1080 Full HD supported. Features: Image Stabilization, Wi-Fi, Geo tagging, Intelligent Digital Zoom, primary colour filter. . Recommendation:FujiFilm is well known as a all round tiny action camera with rugged credentials. People love to use it for group shots and selfies whereas its waterproof body make it suitable for under water applications. It is a well design model that can be used in tough weather conditions without losing quality of stills and videos. Battery life may little disappoint you. The intelligent digital zoom capability is really useful and snowboarders will definitely love to capture stunning shots with it. Features: 360 degree FOV, Electronic Image Stabilization, Wi-Fi+ Bluetooth. Recommendation: It is an easy to use action camera model that can record video with 360 degree content. Experts recommend it for capturing shoots on travel as its battery can be recharged to boost the working hours. It works with companion application and the water resistant body can make operation easier under water. If you love sharing videos on channel then its direct YouTube support will be beneficial for you. The price range is higher but it can serve with outstanding results even under water and under low light conditions. Note that this device is water resistant not waterproof so if you want to use it for under water needs then you need to buy additional water proof housing. Recommendation: This device is able to deliver 4K resolution ability at 30fps frame rate hence it is rated useful option for low budget people. You can also live stream your footage using Wi-Fi controls. 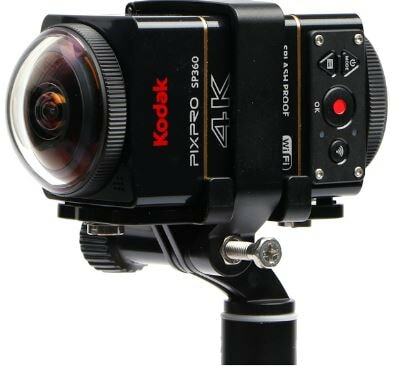 If you are an underwater shooter then this camera is not recommended for you. Battery life is rated to be good for long hour recording but you need to keep Wi-Fi and applications disconnected. Professional rate is best option for low budget needs but it can still serve with impressive results and it is much easier to share life events on social media platforms with the help of Wi-Fi and App connectivity.